14/7-The estate of Blackwood magnate Marco De Santana is on lock-down today as officials state that several of his holdings came under attack over the weekend. The rash of violence began late last week, when several armed men raided a distribution center on the outskirts of the Monteddorian capital. The culprits gained access to the facility using a De Santana Refining airship. It was then, officials say, that the attackers struck, killing everyone but the lone factory worker. They then loaded the two empty ships at the site full of Blackwood, and stole another that was completely loaded up. They then sabotaged the equipment and flew away. Since then, several other De Santana owned locations throughout Monteddor have been hit. The Monteddorian Air Guard claims that it has no concrete idea on who the culprits were, but they believe the raid was led by an insider. De Santana himself, however, has an idea. When asked if he was worried, De Santana laughed. 2/7- Yesterday it was announced that a ‘task force’ was being formed by the Crowndon Air Corps to hunt down and presumably kill the Crowndonian Admiral turned pirate Roderick Beauchamp La Pierre. Personally, I think we here in Nor Easter ought to grant him asylum, and slap a medal on his chest while we’re at it. After all, if one man could be said to be more responsible for our victory in the war with Crowndon three years ago than Sir Rigel Rinkenbach, it’s La Pierre. Sure, it was Rinkenbach’s planes that ripped apart La Pierre’s fleet, but it was La Pierre’s hubris and stupidity that made that defeat so easy, and so complete. Had La Pierre not led his ships into the tightly formed mesas of the Divide, he may have been able to spread his fleet out. His ships could have fallen back in the face of our new death machines and re-grouped. As it was, La Pierre made it like shooting fish in a barrel. And now the news that La Pierre’s little prank with the gold and the fish has caused a severe economic downturn…I can’t help but laugh. This former war hero, Crowndon’s most decorated young officer, has in the end done more damage to Crowndon than we ever could. If I didn’t know any better, I’d say that every Nor Easter man, woman, and child owes La Pierre a debt of gratitude and a hug. But I do know better; La Pierre is a disgusting brute, so don’t do that, lest you catch something. *Editor’s Note: Mr. Wilderspin’s thoughts and opinions are his own, and do not necessarily reflect those of the Blackwood Gazette, particularly those offices located in Crowndon. 1/7- The repercussions of Roderick La Pierre’s recent theft of several thousand pounds of Crowndon gold continue to pile up, as Imperial Authorities say that attempts to sanitize the gold after being buried under tons of rotting barrier tuna have proved fruitless. Those companies that actually made it into the vault to clean the gold had no luck. The Crowndon Treasury has grown impatient, and says there is only one sure fire way of eliminating the odor. The question remains: are La Pierre’s actions going to remain unchecked? 23/6- The tabloids are in a frenzy today as NorEaster’s favorite former power couple, Rigel Rinkenbach and Pixie Sinclaire, were both seen in Oeil de Fleur last week. This prompted rumors about the possibility of the estranged duo getting back together. Sources indeed confirm that Rinkenbach and Sinclaire both were in Oeil de Fleur last week; Rinkenbach was spotted at the popular brothel Big Bessie’s Burlesque, sipping Absinthe and discussing something with a group of fellow alchemists. Sinclaire, meanwhile, was reportedly visiting the death bed of an old war comrade, on the other side of town. Trust me, dear readers, you do not want to know what the diorama depicted or what was holding it together. On another note, the alley was nowhere near either location. It was outside my domicile, which disturbs me greatly. 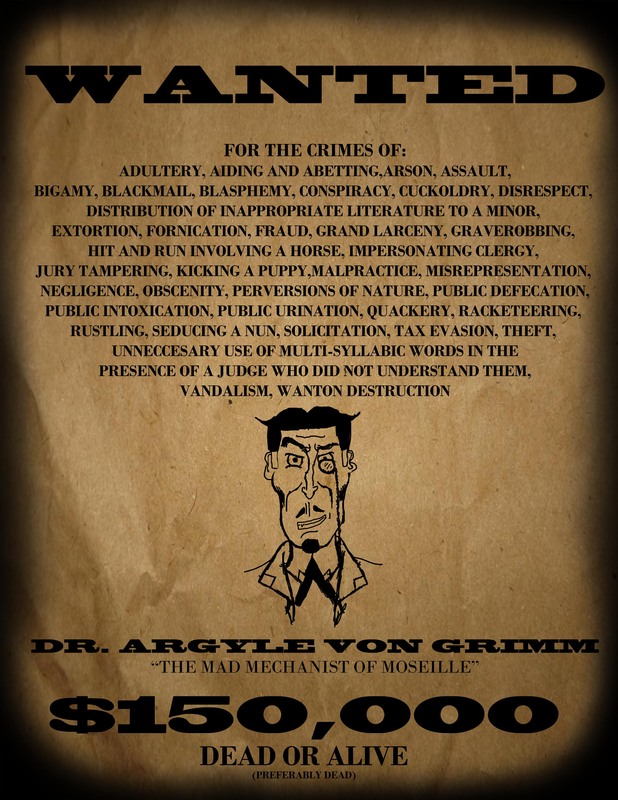 19/6- Doctor Argyle Von Grimm, a.k.a. the Mad Mechanist of Mosaille, has reared his head once more, this time along the frontier of the Imperial Colonies. Even worse, he has brought a gang of mechanically enhanced malcontents with him. For the last month, Colonial authorities report that Von Grimm has attacked, occupied, or reduced to ash at least fifteen frontier townships. The Colonial Marshals are at a loss on how to deal with Von Grimm and his gang. To date, they have sent several posses after the miscreant, and to date, each of these posses have turned up buried to their necks in the sand, their heads swollen from the desert sun. Law men refuse to deal with the situation out of fear, and many settlers have started migrating back east. Von Grimm’s reign of terror has put a sizable dent in the trade of furs, coal, and other goods from the frontier. Desperate to put an end to it, the Colonial government has issued a 150,000 dollar bounty for Von Grimm or any member of his gang, dead or alive, and a 10,000 dollar bounty for any leads to the bandit’s hideout that bear fruit. To date, neither bounty has been paid. 17/6- New reports conducted by the Crowndonian Census Bureau and the NorEastern Department of Tallies and Numbers show that employment in the industrial sector of both Empires has tripled in the wake of Ivan Klankenvroot’s challenge to Rigel Rinkenbach to see who could develop the world’s first workable commercial airplane. Outside parties with no stakes in either Crowndon or NorEaster’s national interest are urging a healthy skepticism when reviewing the reports, stating that while there is no doubt that employment has risen in both Empires, the numbers do not reflect the truth. Hunter O’Leary is the Gazette’s new Business Analyst. He graduated at the top of his class from Walsh Business School. After graduating, he served in the Crowndon military as Keeper of Finances and Sundries during the Dividing War. He has an affinity for pickled cow’s tongue. 10/6-I sit in a darkened coliseum, surrounded by pillars of the Imperial community from all walks of life; military personnel, industrial leaders, respected authors, famous inventors. It’s 1200, and we’ve all been up since five this morning. We’ve been sitting here for three hours, packed in like sardines. It’s hotter than a boiler room in here, and I’m sweating through my note pad. The smell is nigh unbearable. We’re hoping for a glimpse at the next “New Big Thing”, whatever that is. The presenters would have you believe it’s whatever they’ve come to show us, and there are a lot of presenters. I’m going to be in this seat for twelve more hours, listening to corporate vagaries trying to make out commercial endeavours to be some life changing thing. Right now, I’d settle with someone, anyone, inventing a machine that can keep a coliseum like the one I’m in at a decent temperature. Climate control…do you hear that, inventors of the Triumvirate? Get on that. The first presentation is from a company called Velcom Technologies. These guys were little more than a start up last year, relegated to a small booth outside the fair ground. Now they’re opening the main stage. They show off plans for a new type of offensive explosive device that is activated by pulling a pin, which initiates a three second fuse. The Crowndonians in the room go nuts. The demonstration is less smooth, as the presenter blows off his own arm on stage. He’s rushed out of the coliseum, which is now filled with smoke. “Perhaps Velcom should think about increasing the fuse to five seconds,” the host jokes nervously. Thankfully, no one laughs. The presentations for the next two hours aren’t anything impressive–mild variations and improvements on items we saw last year, or the year before last. At 1300, we’re served rations of gruel. Again, I’d just be grateful if someone announced some sort of complete meal in a convenient bar that I can carry in my jacket pocket. Finally, we get to the presser that everyone’s been waiting for: Rinkenbach Research and Development. A group of fifteen women appear on stage, dancers by the look of them. They begin dancing and singing a song about the horizon, laced with lazy sexual innuendos. Rigel Rinkenbach himself appears on stage in grand fashion, lowered from up above by wires. He joins in on the song and dance routine, which culminates in an impressively garish pyrotechnics display. Sparks fall on the ground, but luckily none of them catch, like last year. The dancers shuffle off stage, leaving Rinkenbach by himself to give the presentation. He looks winded, but other wise he’s as energetic as ever. So what’s he unveiling? The world’s first commercial Planar Wing Aircraft. When the plans are unveiled, I hear a loud curse from backstage. Ivan Klankenvroot is the next presenter, and with the recent enmities between him and Rinkenbach, it’s a given what Klankenvroot was planning to unveil. Sure enough, that’s exactly what it is: his own plans for a PWA aircraft. Half of the audience is snoring before the presentation is over. The final presentation is given by a company I’ve never heard of: Foundation Inc. Their presenter tells us that he has nothing to show, but something to demonstrate, something that will change interior venues the world over. I hear a clunking sound over head, and rattling coming from strange metal tubes lining the ceiling. After a moment, I’m beginning to wonder if something is wrong. Then I feel it…cold air, descending from the rafters like a refreshing blanket. There it is. That’s it. That’s what I’ve been waiting for. Then I realize that Foundation could have given its presentation at the BEGINNING of the day. Alex Grosset is an alum of the Empress University. Born and raised in Oeil de Fleur, he likes nothing more than enjoying a play by night, and ripping it apart by day. He was the first staff member hired by the Blackwood Gazette’s Nor Eastern offices.